The closest dropzone to Copenhagen. Tandems, students and experienced jumpers welcome. Vi har som vores primære formål, at skabe dygtige faldskærmsspringere og udbrede kendskabet til faldskærmsudspring, samtidig med at vi har det sjovt sammen. Faldskærmsudspring er en spændende sport, og i de senere år er der udviklet flere grene inden for sporten. 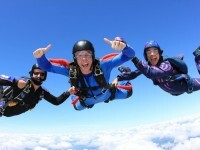 Do your tandem skydive at Roskilde Airport. The nearest dropzone from Copenhagen. Great DZ with no restrictions, due to it's position in western Denmark. Lots of places to land. 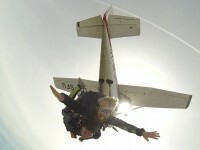 Denmarks one and only full-time professional Dropzone. Europes biggest swoop pond. Fulltime cafe and really cheap accommodation. USPA foreign affiliate. 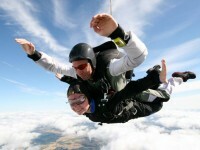 Do your tandem skydive at Stauning Airport. Best view over the westcoast. Located 100km North of the German border, this centrally located club usually jumps every second weekend year round and every Wednesday evening in the summer period. Check out the website for exact jump activities, detailed pricing and more information. NEW covered packing area with 2 bars, videobriefing facilities and manifest. 1200 meter asphalt runway that will take any A/C. Skyvan Boogie every year. Huge landing area.